That's right theatre fans. Everyone's favorite star-crossed kids are back. Romeo and Juliet, which rank's as one of William Shakespeare's greatest play's began preview's at the Garrick Theatre on May 12. The show, which is being presented by the Kenneth Branagh Theatre Company, features the stars of 2015's live action film version of Cinderella, Richard Madden and Lily James. Oh and did I mention that Sir Kenneth Branagh is also directing the production as well? That is going to be one hot ticket my friends. Now the truth is you all know the plot. Two families. The Montagues and the Capulet's. Enemies for centuries. Romeo and Juliet, two teenager's from each family, are drawn together despite their parent's hatred for each other. In the end the love they share can not overcome the obstacles that they face. It is only thru death that the young lovers can finally be together. Now that is one screwed up love story. But who cares right? It's a classic. A classic that deserves to be seen. Luckily for you we sell tickets for it. In fact we sell tickets to each and every show in London. Who knew? 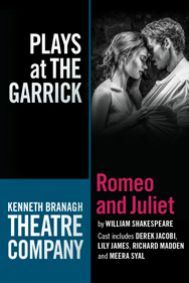 Get your tickets to see Romeo and Juliet at the Garrick Theatre in London. You will love it.